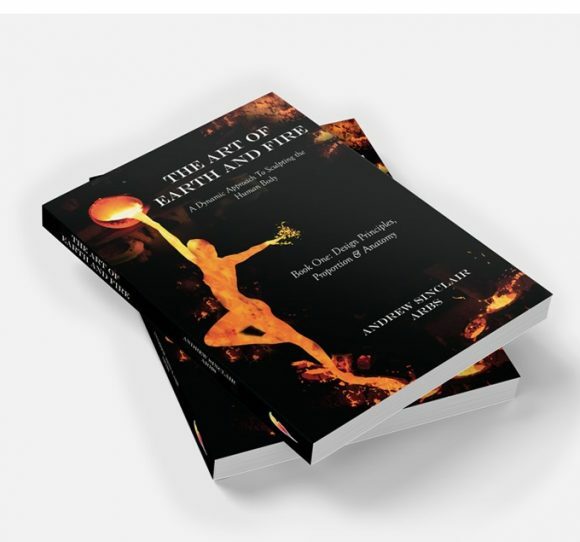 The Art of Earth and Fire – published by Austin Macauley. The Art of Earth and Fire is the first book by Andrew Sinclair MRBS. He is recognised as a master of world-class realist figurative sculpture. It is based on his ground-breaking ‘Sinclair’ method, which completely transforms the building and creation of Contemporary realist sculpture. This method is revolutionising the approach to sculpture, also acting as a powerful source ofknowledge, enabling students searching for excellence to become professional masters of their art. The Art of Earth and Fire deals with the foundations of good figurative sculpture and offers a profound understanding of measurement, anatomy, design and composition in an easy to understand format that will shock and inspire established and beginner sculptors alike. “Andrew Sinclair’s book, “The Art of Earth and Fire” is a revelation! His techniques for teaching the complexities of anatomy, proportion and muscle structure are the clearest and most precise I’ve ever had the pleasure of discovering. Each easy to follow step in the process of sculpting a human figure is explained and demonstrated in great detail and in a way that truly helps one to understand how and why a human body looks and moves the way it does. For beginning sculptors, for professionals working in the field already and for anyone wishing to sculpt a beautifully proportioned and rendered figure, this is an essential book, to refer to again and again. I will certainly be recommending it to my students – and for all of those who ask us how to go about having a career in film, the answer is simple – start here!” Wendy Froud. Andrew’s book is the first definitive ‘how-to’ guide about realist figurative sculpture techniques in over 100 years.